You need strong testimonials in your virtual assistant business if you want to land more clients. No matter how good your about page is or how enticing your offers are, nothing is going to say more about working with you than your clients own experiences. Your potential client is taking a the leap of faith and wants to know that they can trust you. Client testimonials prove that you can do what you say you’re going to do. It helps show that you’re reliable and trust worthy. It may sound a little overwhelming or feel a little intimidating in the very beginning, but getting great testimonials is really in your hands. 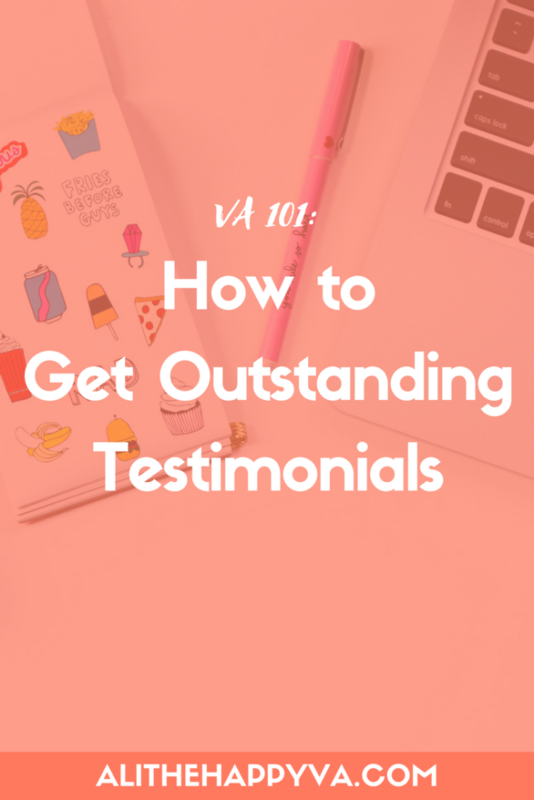 It’s up to you to set yourself up to collect great testimonials right from the beginning. This is wonderful because you have the power to make them happen! The first step in receiving fantastic virtual assistant testimonials is to provide an excellent client experience. An exceptional client experience is about much more than getting your job done. Before you agree to work with the client, make sure you’re a good fit. Ask a lot of questions and try to suss out if your working styles are compatible and if you can provide the services your client needs. If you sense they’re not fully on board with you, try to address their concerns right then and there, before there’s a problem. Throughout your work together, check in with the client, give them updates and get feedback as you go. Save these emails, slack chats (or however you communicate) for later. Try not to wait or be shy about asking for a testimonial. (I’m guilty of this and I’m sure other introverts are too!) After you’ve completed a project your client is super happy with is the best time to ask for your testimonial. Sometimes this happens organically, but if you sense they’re impressed with your work, this is the time to act. You don’t just want to wait until you’ve completed your work together. You want to get with them on this while they’re in a good place. I’ve found that saving feedback is the easiest way to get testimonials. As virtual assistants, we’re usually working with very busy peeps. Rather than asking your client to write you a testimonial from scratch, make it a simple “yes” or “no” for them. Go through your emails and pull quotes from the best feedback you have from them. Then, put it together into a coherent testimonial (but still using their words). After that, you can just send to them and ask for permission to use (and if they want to make any edits, of course). This testimonial will be genuine, demand nothing of your client’s time, and usually makes everyone happy all around. Don’t forget to also regularly do a search for kind words and shout-outs on social media about your business. I have a few clients who will occasionally do this via Facebook and it’s lovely. Screenshot the posts (<—-I always forget this part, but try to remember!! ), save the words in a spreadsheet, and you’ve got the perfect bite sized love notes to add to your site! Another fine way to get some feedback/testimonials is to create a survey and ask your clients to fill it out (with permission to share some or all their responses). This can be a great way to get clients to comment on specific things they like about your business and working with you. Just don’t make this survey super long and all-encompassing. As I mentioned above, clients are often swamped with too much on their plates as it is. They don’t want more homework. Keep it to 2 to 3 questions. Give them the space to provide a long answer if they feel inspired, but that way there’s no pressure. Lastly, feel free to just straight up ask for your testimonial. Maybe giving them a few questions as guidelines as well via email. What were you most worried about when hiring me as your new VA? How has working with me as your VA changed your business? What’s your favorite service that I provide and why? 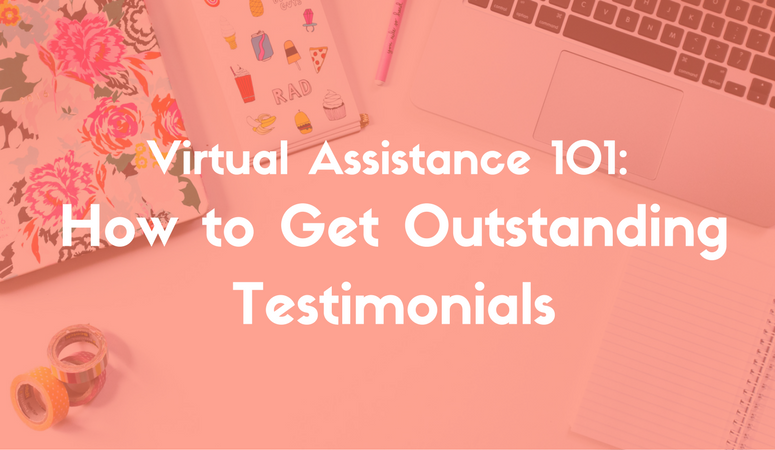 What’s the best way you’ve found to get great virtual assistant testimonials? This is helpful! And definitely it’s our responsibility to get testimonials. Do you have a template we can send to our clients to help them write a testimonial that they don’t have to think too hard about? Thanks!